The film, When in Rome (not the 2010 release starring Kirsten Bell and Josh Duhamel, but rather the 2002 home video starring Mary Kate and Ashley Olsen), might be fun for you to rent on family movie night! 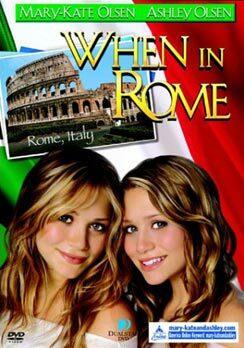 It's a cute story about two young girls (Mary Kate and Ashley) who are in Rome for a summer intern program. They are fired due to a few careless mishaps, but it all turns out okay because they find young romance and go joyriding all around the sites in Rome. Perks for the grown-ups watching the video are, of course, the gorgeous shots of Roma: the Forum, the Colosseum, the Vatican, the sweeping vistas of the ancient city, etc., but children getting ready to visit Rome will appreciate the images, too. Young kids are always interested in seeing something they recognize from TV! Watch the trailer here to see if it's appropriate for your kids. My kids LOVE Mary Kate and Ashley. Rome might be on the agenda this summer so we'll definitely be looking into that.